If you think that engineers are all head and little heart this interview will change your mind. Mathysa, in addition to being a Maker with creative ideas and a mom, is also an engineer. Her jewelry, original creations made with laser cutting, are born from a mix of art and technology and a real invitation to dream. Read it to believe it! Mathysa, your jewelry is a mix of technology and elegant creativity: do you call yourself an engineer with a poetic heart? How you became a jewelry designer? I've always had a great passion for art, thanks to my parents who loved to paint and draw and that allowed me to grow up in a world of love for beauty and creativity. This has never been in conflict with my choices in life, my work as an engineer or my love for technology. The passion for art and the technological side coexist in me without conflict, I love both aspects, and sometimes I can combine my passions into one project. Thus was born my project as a Maker. The passion for art in the past has made me love various forms of artistic expression, such as ceramics, painting, etc.. 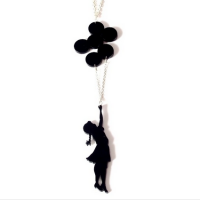 When I discovered laser cutting I could combine my passion for art with technology, it was love at first sight! Finally I was able to create what I liked and make it affordable. Which materials and techniques do you use? And how do you combine your artistic inspirations with this technical choice? I love black acrylic satin, I find it extremely elegant and suitable to draw simple but refined shapes. I design my objects, which are then laser-cut, and finally I assemble the whole thing personally. My sources of inspiration are varied as are the styles that my jewelry offers. Ranging from Art Nouveau to street art, I also like the geometric shapes that seem to draw an ornament on the body of who wears my jewels. 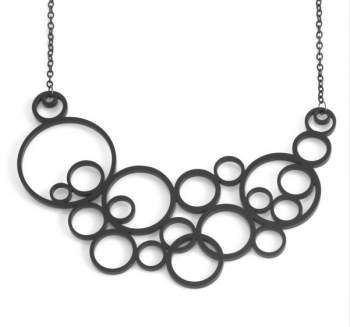 I think that my Bubbles necklace, with its simple geometric design, is one of the jewels I am most fond of. Probably because it was created with ease, without a second thought, in a few hours the design took shape and when I wear it I get a lot of compliments. 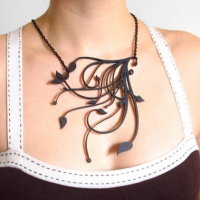 But I also love Art Nouveau and Girl necklaces, they are all creations that do not go unnoticed! 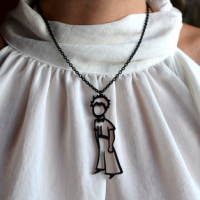 What would you like a woman wearing a Mathysa jewel to communicate? Do you have a precise emotion when you make your creations? Much of my jewelry is created by thinking of a confident woman, realized in her work, who likes to wear jewels that are out of the ordinary but convey elegance and sophistication. There is also jewelry that I made for more poetic and romantic women who want to communicate their love for imagination and dreams. In my jewelry you will find different souls, maybe they all are a little part of me. In the end I believe that those who design jewelry design in some way a part of themselves. Now, just a few weeks before Christmas, do you want to tell us why we should choose a gift made by a Maker? Because we must believe that in Italy we have the strength and the intelligence to make it. We can't just hope to escape abroad or find a poorly paid job. Because in Italy we have creativity, ingenuity, enthusiasm, love of beauty and art and believing in those who try means there is hope for a better future. Of course I'd be happy if my work encounter more and more attention and maybe one day this could become a full time job. What story are you most connected to and maybe share with your girls? Yes, there is a story to which I am closely linked and that story I tell my daughters in a more simplified version. 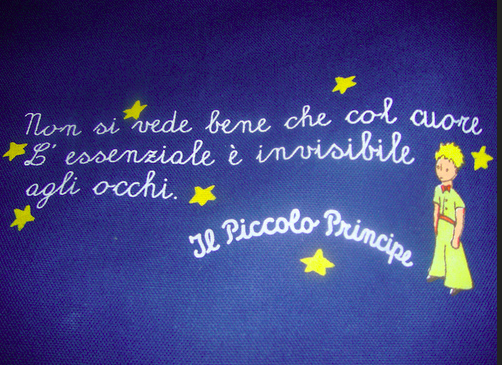 It is not a fairy tale, but a fairy tale for adults that I loved so much as to want to make a small representation in my collection: it's The Little Prince. I designed it thinking that the wearer knows that "what is essential is invisible to the eye." Do you still have doubts about the heart of engineers?